It’s been six years since we launched this website to share the MacFarlane collection with Inuvialuit and the world. Now we want to expand the site to include objects from archaeological sites across the Inuvialuit Settlement Region. Our motto for Phase 2 is “go big or go home.” In that spirit, we’ll kick things off this September with a Community Gathering at East 3 Secondary school in Inuvik. 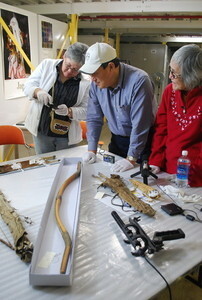 We’ll bring together Elders and knowledge holders from across the ISR, students from the school, and Inuvialuit artifacts. The artifacts will come from collections at Prince of Wales Northern Heritage Centre in Yellowknife, and Parks Canada’s Winnipeg Service Centre. We’ll throw open the doors for the whole community to join us, and we can all share and learn about Inuvialuit culture together. Looking ahead, we’re planning an On-the-land Culture Camp in the summer of 2019. Participants from across the ISR will take part in traditional activities like traditional food harvesting and preparation, tool-making, and sewing. We’re looking forward to all this and more in the coming years. Watch this space and like us on Facebook to keep up to date on project activities. We hope you’ll join us!